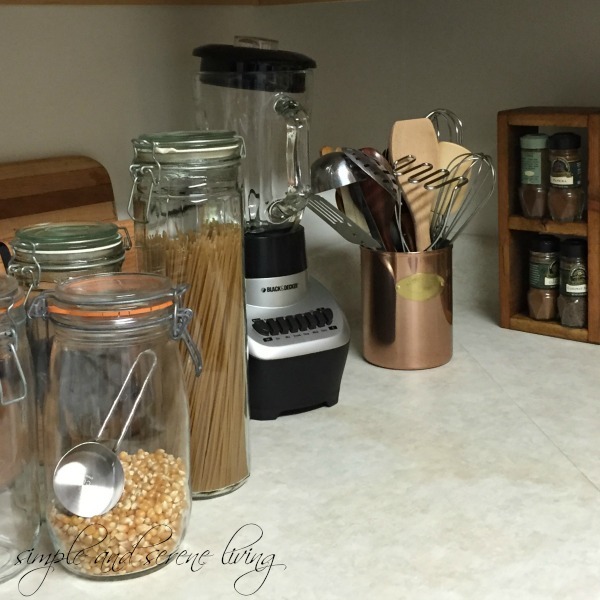 I have been working on setting up my new kitchen this past week. It is the most important room for me to get done, because I am cooking all of my meals. I took a few photos of one corner, right after I moved in to show you the direction I am taking. I won these three little shelves several years ago and packed them away because I wasn't sure what I was going to do with them. 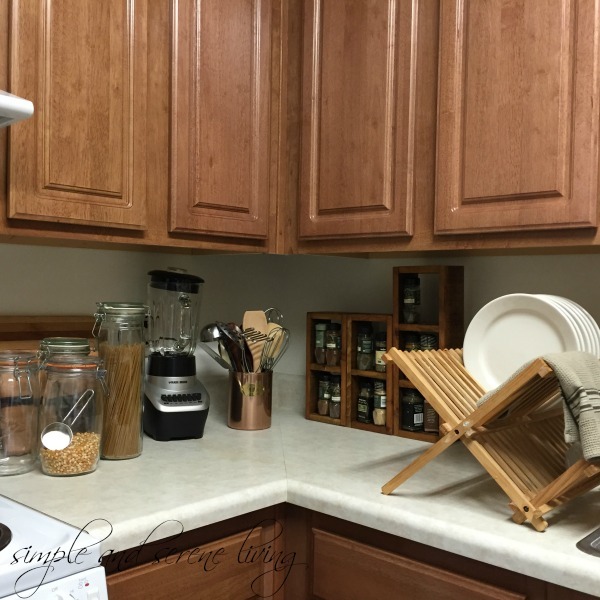 It is fun to go in a new direction with my kitchen decor and I feel like things are just falling together. I am mixing copper, glass, stainless steel, and wood in this room. I love the eclectic look and it is inviting to be in this fairly small space. Just a few quick shots of a work in progress. I was so tired after the first wave of packing, moving, and unpacking that I have had to rest some this week. My apartment is so quiet and relaxing that I find myself drifting off to sleep at all hours of the day. I am not normally a napper, but I guess my body is letting down from all of the stress. Most of this first wave of unpacking is done, but I need my furniture from North Carolina so that I can put the rest of it away. Hopefully I will be able to get that done in a couple of weeks. I need to get it out by the end of the month. In the meantime, if you are looking for me I will probably be sitting on my new settee staring out at the trees. Laura, looks lovely. Moving is definitely stressful. I haven't done it in many years and yet I still vividly remember! shiver I helped a friend move a couple years ago and she was convinced her new place was going to be too small, so she kept saying "Well, in a year, if I want to I can find another place." I think all of us helping her were ready to slap her after about the third time she said it -- moving is hard work! Glad you're settling in nicely! I love your settee! 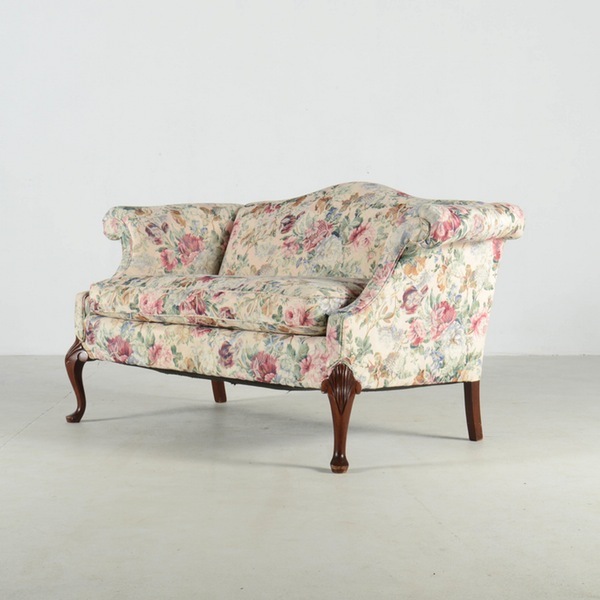 So pretty ~ chintz is a favorite of mine. A while back, I picked up a 1978 issue of Country Living at an antique shop. The issue has a big article about Martha Stewart (she looks so young) and her kitchen. It is a bit over the top for today, but I love seeing all the organic elements. She too mixed copper, glass, stainless and wood. It all looks functional for a serious cook, yet has really cozy elements about it as well. I will be anxious to see what you do with your space because I am sure it will be wonderful. Wishing you every happiness in your new home! Oh Laura, it does my heart good to see you decorating your very own digs. Every day I wonder what you're doing in your little apartment and if things are falling together. 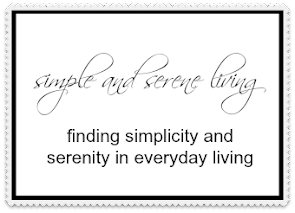 Isn't it wonderful to close your door on the world and have silence? No one is happier for you than I am! Or looking forward to more glimpses! Welcome to your new place, Laura! I like how you have the kitchen set up, so far. Moving is very tiring and stressful, no wonder you're falling asleep during the day. Be good to yourself and just go with the flow. Love your new settee! Welcome home! I love the direction this is taking and can't wait to see more!! I'm so glad that you're liking your new place! It looks like you're already settled in the kitchen. It's good to work on that room first. I hope you'll get the rest of your things moved in soon. 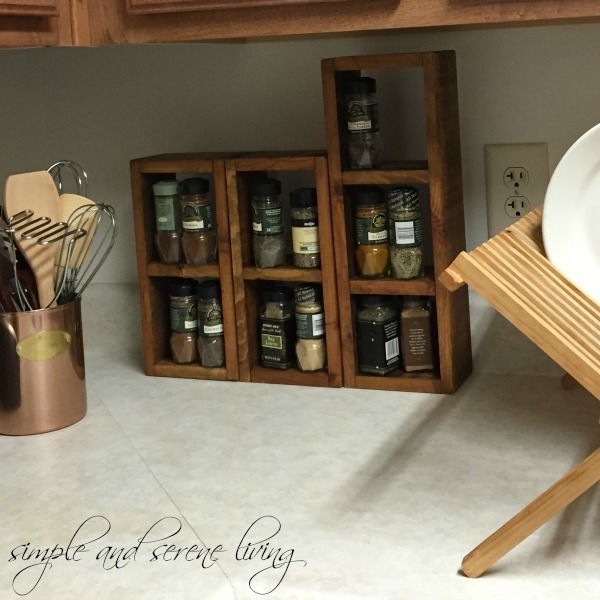 Your little wooden cubbies are perfect for your spices. Your kitchen is coming along quite nicely. Your new settee is beautiful. Enjoy! laura, best of luck in your new home. I am so happy to hear the joy in your voice. Such a wonderful thing your own place. My kitchen is small also and has been fun to decorate. I'm changing some things around soon, just an update for me. Enjoy and take those naps!! Oh Laura loving your kitchen already. I know exactly what you are going through with moving. It is stressful but so rewarding in the end. Enjoy getting settled and setting up your new place. You too? We hadn't moved in 25 years and there were times we thought we'd die we were so tired. Been here 4 weeks today now and decided to take a day of true rest. Maybe I'll extend that to a few more days! The kitchen was the first room that had to get set up because the first few days of takeout food could not go on. I hope your furniture and you arrive safe and sound!